ABC’s Dancing With the Stars led the network to a first place finish among viewers, but CBS’s comedies and CSI: Miami put the network in first place among adults 18-49. Elsewhere on the evening, though the series returned with less than 2.5 million viewers (2.44 million), Gossip Girl had a mostly successful return in its new timeslot. The series was up by 7% among viewers and 18% among adults 18-49 from its last newly aired episode. ABC finished in first place for the evening with a 8.8/14 household rating/share and 13.15 million viewers, but was second among adults 18-49 with a 3.5/9 rating/share. 8:00 p.m.: Dancing With the Stars (11.7/18 HH rating/share, 17.82M viewers, 4.3/11 A18-49 rating/share). 9:30 (9:32) p.m.: Samantha Who? (7.0/11 rating/share, 10.13M viewers, 2.9/7 A18-49 rating/share). 10:00 (10:02) p.m.: The Bachelor: London Calling (5.4/9 HH rating/share, 7.66M viewers, 2.7/7 A18-49 rating/share). CBS followed in second place for the evening with a 7.3/11 household rating/share and 11.46 million viewers but managed a first place finish among adults 18-49 with a 4.0/10 rating/share. 8:00 & 8:30 p.m.: The Big Bang Theory (4.7/8 HH rating/share, 7.51M viewers, 2.9/8 A18-49 rating/share) was followed by How I Met Your Mother (5.2/8 HH rating/share, 8.52M viewers, 3.7/9 A18-49 rating/share). 9:00 & 9:30 p.m.: Two and a Half Men (8.3/12 HH rating/share, 13.28M viewers, 4.9/12 A18-49 rating/share) was followed by Rules of Engagement (6.7/10 HH rating/share, 10.63M viewers, 4.1/10 A18-49 rating/share). 10:00 p.m.: CSI: Miami (9.3/15 HH rating/share, 14.42M viewers, 4.3/12 A18-49 rating/share). NBC finished in third place for the evening with a 6.3/10 household rating/share, 9.86 million viewers and a 2.8/7 rating/share among adults 18-49. 8:00 p.m.: A two-hour edition of Deal or No Deal (6.4/10 HH rating/share, 10.02M viewers, 2.6/7 A18-49 rating/share). 10:00 p.m.: Medium (6.4/10 HH rating/share, 9.54M viewers, 3.1/8 A18-49 rating/share). FOX followed in fourth place for the evening with a 5.3/8 household rating/share, 8.34 million viewers and a 2.6/7 rating/share among adults 18-49. 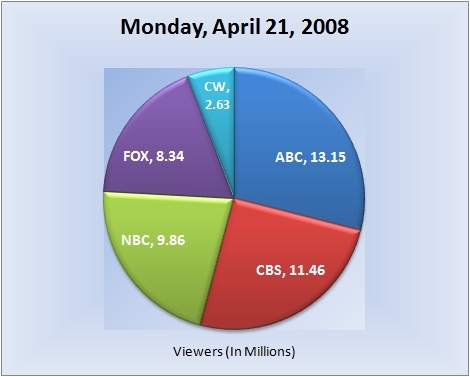 8:00 p.m.: Bones (5.4/9 HH rating/share, 8.64M viewers, 2.7/7 A18-49 rating/share). 9:00 p.m.: And that was followed by a repeat of House (5.2/8 HH rating/share, 8.04M viewers, 2.6/7 A18-49 rating/share). The CW was left in fifth place with a 1.7/3 household rating/share, 2.63 million viewers and a 1.3/3 rating/share among adults 18-49. 8:00 p.m.: Returning from a more than three-month hiatus in a new timesot was Gossip Girl (1.7/3 HH rating/share, 2.44M viewers, 1.3/3 A18-49 rating/share). 9:00 p.m.: Was followed by One Tree Hill (1.8/3 HH rating/share, 2.82M viewers, 1.4/3 A18-49 rating/share). Note: Network average numbers from the week prior are based on fast national data. Comparison’s from the week prior (or episode-to-episode, etc.) on specific shows are based on final national data. Ratings for the current day are based on fast nationals. (Expect all three scenarios to be the case at all times, unless otherwise noted). The final rating for first-run episodes that aired this evening will be reported the following week. So for example, the final rating for tonights episode of “Dancing With the Stars” will be reported in next weeks report for Monday, April 28, 2008.